Ocala, Florida — The sheriff’s office received two calls on Sunday, September 29, 2013 around 10:10 p.m. about a suspicious vehicle that was parked halfway in the road in the area of the 10300 block of SW 129th Terrace Road. When deputy John Lightle arrived at the location, he observed a black 2009 four door Hyundai parked halfway in the street obscuring the flow of traffic with all of its lights off, according to reports. The deputy approached the vehicle and discovered the driver identified as Karen Drake, 51, lying in the front seat. There were mounds of clothes and personal items inside the car, along with the woman’s dog sitting in the front passenger seat. The deputy tapped on the window for several minutes trying to get the woman’s attention, but she appeared to be ignoring the deputy and would not acknowledge him after he announced himself, according to the deputy. Finally, Drake opened the door and the deputy was greeted by a very strong odor of alcohol emitting from the vehicle. Drake told the deputy that she had been “kicked out” of her house and was homeless, living in her car. According to the deputy, Drake’s speech was extremely slurred and her eyes were blood shot and watery. The deputy also discovered that the woman was completely naked from the waist down. When the deputy asked her why she was not wearing any pants, she said that she had urinated on herself earlier. The deputy then found some pants in the back seat and asked the woman to get dressed and returned to his vehicle to give her some privacy, the report said. 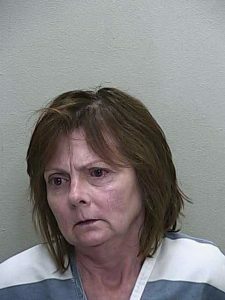 When asked how much she had to drink, Drake initially stated that she had not had any alcohol, but later advised the deputy that she had consumed two “fireball whiskey” shots. Drake stated that she had vomited earlier in the evening in a public restroom, and had pulled over to the side of the road because she felt that she should not be driving. The deputy reported that her car keys were within arm’s reach, near the center console. He asked her if her vehicle had ran out of gas and she said, “No,” and the deputy asked her to confirm that by starting the engine, which she did. Drake stated that she does take prescription narcotics, but had not taken any that day. She was asked to perform a field sobriety test, which she agreed to do. During the exercises, Drake repeatedly lost her balance, started the test before the deputy was done giving directions, and stepped off the line. On the walk and turn exercise, she only took a few steps before stating that she could not perform the exercise and then sat back down in her car, according to the deputy. The deputy then advised Drake that she was under arrest for DUI, and she became uncooperative and briefly struggled with the deputy before he was able to secure her and place her in his patrol car. When the deputy was performing an inventory search of her car he found an empty “boxed wine” box in the back seat. Upon arriving at the jail, Drake refused to submit a breath test and stated that she needed to consult an attorney. Records show that Drake has had one prior DUI. She was booked into the Marion County Jail on one count of DUI Second Offense. The dog was placed in the custody of Marion County Animal Services.